All the information you need for Saturday’s huge blockbuster event. Weigh-in coverage begins at 1 pm PT / 4 pm ET and 9 pm UK. Coverage begins on BT Sport Box Office at 11.30pm UK time. Wilder vs. Fury will be produced and distributed by SHOWTIME PPV. The suggested retail price (SRP) for the pay-per-view telecast is $64.99 for standard definition. The PPV undercard on SHOWTIME in the USA begins at 9 p.m. ET/6 p.m. PT. It will feature unbeaten unified super welterweight world champion Jarrett Hurd returning to take on Jason Welborn. Cuban heavyweight slugger Luis Ortiz facing-off against Travis Kauffman and rising undefeated heavyweight Joe Joyce battling Joe Hanks. 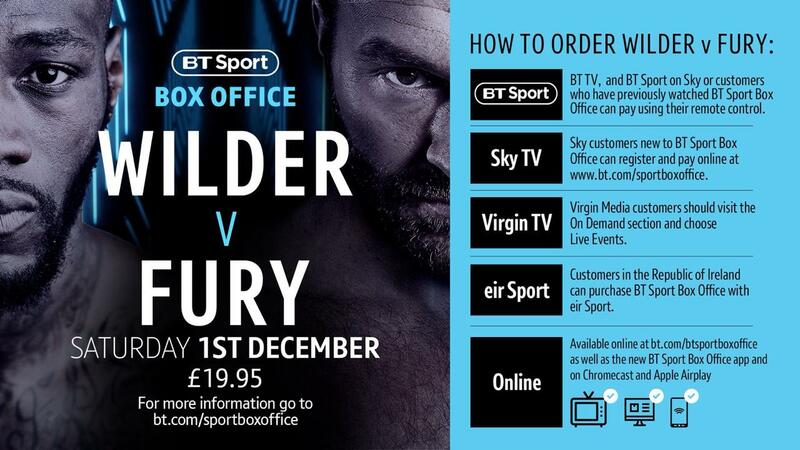 BT Sport Box Office broadcast in the UK from 2 am for a price of £19.95. Main Event will broadcast in Australia, whilst RPC Channel 4 take the reigns in Panama. Tickets for the event, which is promoted by BombZquad Enterprises and Queensberry Promotions, in association with TGB Promotions and DiBella Entertainment, are on sale now and are available via AXS.com.